Somewhere, buried deep under a mountain of jubilant Andover players, was Gunnar Thoreson. Thoreson, a braces-wearing sophomore, had just scored in overtime to lift the No. 2-seeded Huskies to a 6-5 victory over No. 3 seed Elk River on Monday in a Class 2A, Section 7 semifinal at Amsoil Arena in Duluth. And now came the celebration. There was yelling and screaming, “I’ll probably have no voice tomorrow,” Thoreson said. There was the aforementioned dogpile along the boards, “It was awesome,” Thoreson said about being at the bottom of that mass of humanity. There was more whooping and hollering in the locker room afterwards, “Everyone was feeling good,” Thoreson said. In a wild and whacky game that saw multiple lead changes (Elk River held the lead twice, Andover was in front three teams before the OT period) and five tie scores (1-1, 2-2, 3-3, 4-4 and 5-5), Thoreson can be forgiven for not remembering much about his final shift. After taking a pass from behind the net from fellow sophomore Luke Kron, Thoreson found himself high in the slot with plenty of time to aim and fire. The goal was Thoreson’s 12th of the season and biggest of his life. It was among the most memorable in the Andover program’s history, too. The Huskies (22-5-0 and ranked No. 8 in Class 2A in the latest state coaches' poll) will be making just their second section finals appearance on Thursday, when they meet top-seeded Duluth East in a 7 p.m. showdown at Amsoil Arena. Andover senior Brandon McNamara scored twice and had three assists to lead the Huskies’ offense. He was among the last players, however, to leap on top of Thoreson after the victory. Was he worried about crushing his young teammate? As happy as Andover coach Mark Manney was for his seniors such as McNamara, not to mention the Huskies’ huge group of sophomores led by Thoreson, the win capped a bittersweet day for him. Manney learned Monday night that his father, John, had passed away suddenly at his parents’ home in Moorhead. He planned on driving to Moorhead on Tuesday morning to be with his mother and siblings. Like Thoreson, it was difficult for Manney to process all of the game’s momentum swings. Especially with his father’s passing weighing heavily on his mind. John Manney, who was 81, had attended every state tournament since 1972 and was looking forward to attending another one in March. “I don’t remember much about the game, some of the highs and lows,” Manney said. For Elk River (19-8-0) the loss continued a string of section semifinal or championship game setbacks in Duluth. The Elks have reached at least the semifinals in 11 of their 12 seasons since being moved into Section 7. They have not reached the state tournament in that stretch. "I thought we looked sluggish, I though our legs looked heavy," Elk River coach Ben Gustafson said. "I was proud of the kids that they came back all the different times they were down. They never gave up." Sophomore Gunnar Thoreson scored 37 seconds into overtime to lift No. 2-seeded Andover past No. 3 seed Elk River 6-5 on Monday in a Class 2A, Section 7 semifinal at Amsoil Arena in Duluth. Thoreson scored his 12th goal of the season by whipping a shot from the high slot past Elk River goaltender Kyle Esperum. Sophomore Luke Kron set up the goal by firing a pass from behind the net onto Thoreson’s stick. The victory vaults Andover (22-5-0), ranked No. 8 in Class 2A in the latest coaches’ poll, into the section final at 7 p.m. on Thursday at Amsoil Arena against top-seeded and No. 3 state-ranked Duluth East. Elk River junior Jack Perbix forced the overtime session by scoring with 1:16 left in regulation. The goal was the second of the game for Perbix, who has committed to play at Notre Dame. Perbix also added two assists. Senior Brandon McNamara had two goals and three assists for Andover, which held leads of 2-1, 4-3 and 5-3, only to see Elk River (19-8-0) rally to tie the score or take the lead three times. 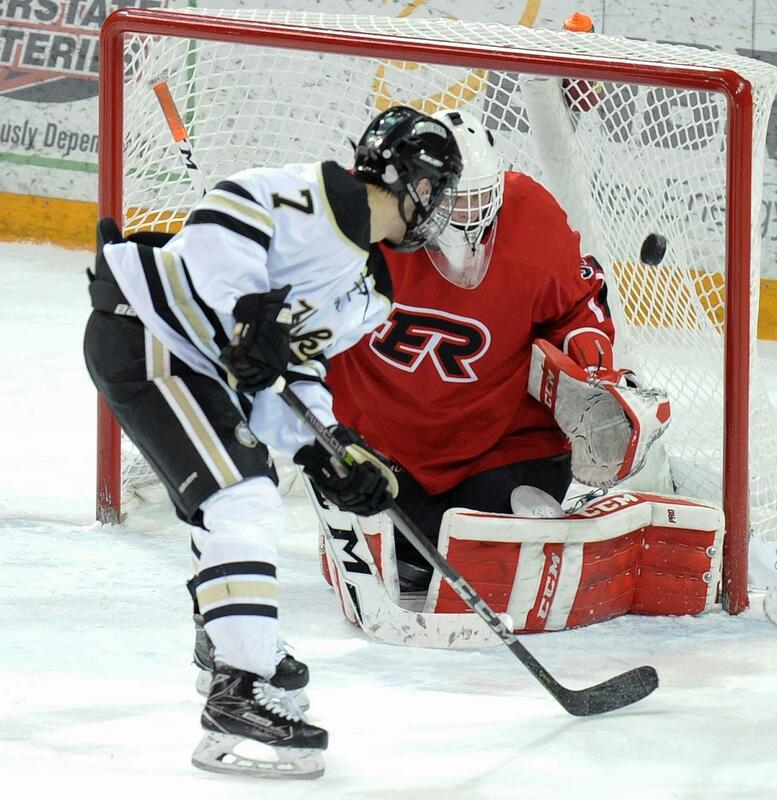 Elk River’s Esperum, a junior, finished with 24 saves. Andover junior Ben Fritsinger stopped 22 of 27 shots. 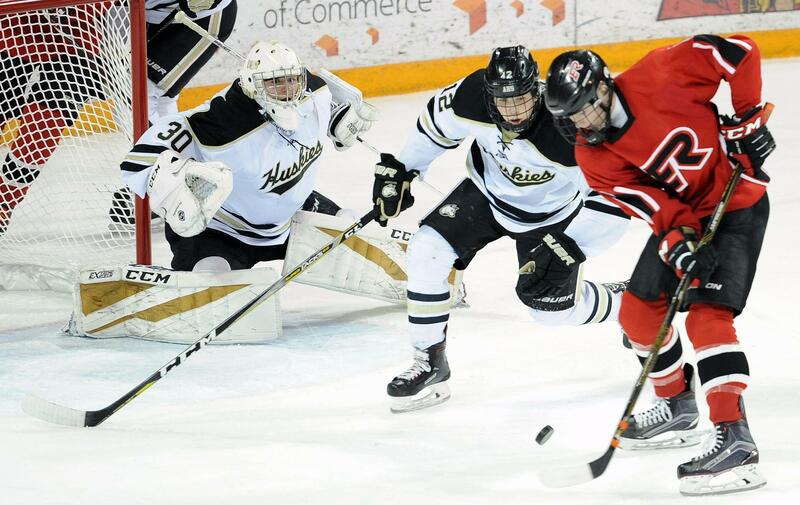 Elk River and Andover, both members of the Northwest Suburban Conference, split their regular season series. Elk River beat the Huskies 5-1 on Jan. 1. Andover beat the Elks 4-1 on Jan. 20.